Backtrack West 1876 Productions presents a colorful and intriguing portrayal of the primary characters and events that culminated in the Battle of the Little Bighorn, otherwise known as “Custer’s Last Stand.” Includes award-winning documentary DVD. 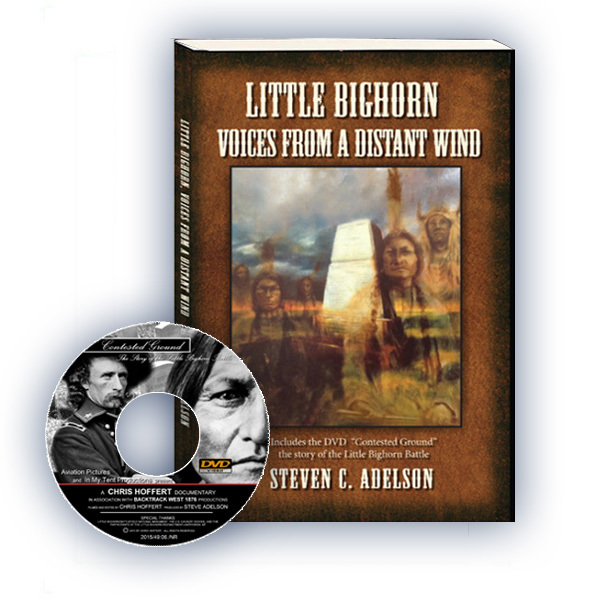 ‘Little Bighorn, Voices from a Distant Wind’ is a compilation of bio-sketches on the primary characters of the Battle of the Little Bighorn. The lives of George Armstrong Custer, Crazy Horse, Sitting Bull, Reno, and others are profiled, revealing the events that shaped their lives before, during, and after the battle. More about the book. Emotionally powerful, this book is the first to paint a picture of the epic fight through riveting lyrical revelations. The book also includes an explosively provocative documentary entitled ‘Contested Ground’ from award-winning filmmaker Chris Hoffert with music composed by award- winning composer Skyler O’Neal. More about the video.